The sin of these particular victims of mass murder? Two theories: they were in school, and remember that Boko Haram means, literally, Western education is forbidden; b) the kids were Shia -- ie, the wrong kind of Muslim. A suicide bomber disguised as a student detonated a bomb at a boarding school in northern Nigeria on Monday morning, killing nearly 50 boys who were between 10 and 20 years old, officials and witnesses said. The bomber was wearing a school uniform when he appeared at the morning assembly at the Government Senior Science Secondary School in Potiskum, according to Mohammed Abubakar, a local journalist who had just returned from the scene of the bombing. When the school prefect asked the bomber why he was not wearing the school’s badge, he knelt down and detonated the bomb, Mr. Abubakar said. After reading the entire NY Times story I just noticed that they never once mention that the town this happened in is a Shia enclave whereas Boko Haram is a Sunni organization. I saw the Shia connection on the BBC coverage of this. Is there some sort of agenda here that the MSM doesn't want us to see here that I'm not comprehending? Or is it just general MSM ignorance? The first bomb detonated around noon, from a car parked in the city of Kaduna, two kilometers outside a gathering of Muslims celebrating Ramadan, said Mike Omeri, the coordinator of Nigeria's National Information Center. Twenty-five died, he said. State authorities were considering the possibility the explosion—triggered remotely—targeted a Muslim cleric, Sheikh Dahiru Bauchi, who has repeatedly condemned terrorism as un-Islamic. "His convoy escaped the bomb blast by whiskers," said Marilyn Ogar, spokeswoman of Nigeria's Department of State Security. Hours later, a second blast hit a teeming bus station in the nearby town of Kawu. Shopkeeper Mustafa Kaka estimated there were about 50 bodies. The second bomb was apparently targeting a guy by the name of Mohammadu Buhari. So, even in Nigeria where the fighting is often described as "sectarian" between the Christian South and Muslim North, a lot of those being killed are Muslims by other Muslims. When will the streets of Paris fill up with protesters condemning Boko Haram or demanding an immediate cease fire? Hell, even if they condemned Nigeria for responding to Boko Haram there would at least be some sort of logical parity for the Left. They could burn down Nigerian businesses. As it is, riots only occur when one side is Jewish. And you don't see John Kerry hopping on an airplane trying to convince Nigeria to stop fighting the terrorist organization. bomb in a van carrying charcoal exploded in a busy market in northeast Nigeria on Tuesday, killing at least 20 people in the latest suspected attack by Islamist militants, witnesses said. The blast from the vehicle bomb wrecked cars and taxis that were unloading passengers and wares on a road adjoining the market in the Borno state capital of Maiduguri. An attack on churches in northeast Nigeria blamed on Boko Haram killed more than 50 people, an official said on Monday, overshadowing festivities ahead of a last-16 World Cup match against France. Gunmen stormed Sunday services in four villages near Chibok in Borno state where Boko Haram kidnapped more than 200 schoolgirls on April 14. They hurled explosives into churches, torched buildings and fired on worshippers as they tried to flee, residents said. Suspected Boko Haram gunmen have reportedly kidnapped 20 women from a nomadic settlement in northeast Nigeria near the town of Chibok, where the Islamic militants abducted more than 300 schoolgirls and young women on April 15. Alhaji Tar, a member of the vigilante groups set up to resist Boko Haram's attacks, says the men arrived at noon Thursday in the Garkin Fulani settlement and forced the women to enter their vehicles at gunpoint. He says they drove away to an unknown location in the remote stretch of Borno state. Break out the #hashtags, there's a war to be won! Nigeria’s military knows where more than 200 schoolgirls abducted last month by Islamist militants are being held and is studying how to rescue them, Chief of Defense Staff Air Marshal Alex Badeh said. “The good news for the parents of the girls is that we know where they are, but we cannot tell you,” Badeh told human rights activists yesterday in the capital, Abuja, in remarks broadcast on Radio Nigeria today. "My girlfriend in Canada found them and told me where to look," Badeh continued, "Also, my totally real girlfriend is a model." I may have added that last bit. After a decade of murdering Christians and Muslims who weren't the right kind of Muslims, the UN has finally decided that Boko Haram is a terrorist organization. And all it took was a bunch of schoolgirls to get kidnapped. U.S. envoy to the U.N. Samantha Power said it was "an important step" in support of Nigeria's efforts "to defeat Boko Haram and hold its murderous leadership accountable for atrocities. Yes, I'm sure that the UN condemning Boko Haram really has them shaking in their boots. The UN: Writing strongly worded letters to mass murderers since 1945. Nigerian Villages Defend Themselves, Kill Over 200 Boko Haram! Residents of three villages in northeastern Nigeria took security into their own hands this week, repelling attacks by Boko Haram insurgents and killing more than 200 of them, residents and officials said. Hundreds of Boko Haram fighters stormed the villages of Menari, Tsangayari and Garawa in the ethnic Shuwa-dominated Kalabalge District on Tuesday. Boko Haram - the group responsible for the kidnapping of nearly 300 schoolgirls from the same region - was met with stiff resistance as locals put up a fierce fight, witnesses said. The Obama Administration should be sending these villages more arms to defend themselves, rather than sending weapons to Syrian rebels. At least 22 parishioners of a Catholic parish in eastern Nigeria were "slaughtered" by Boko Haram attackers on Sunday, the bishop has told the BBC. Stephen Dami Mamza, bishop of Yola, Nigeria, said parishioners from Waga Chakawa village described to him how attackers arrived in trucks near the end of mass. The intruders locked the church, fired guns at those trying to flee, and cut the throats of others, Mamza told the BBC. They set off bombs and for the next four hours, burned houses and took hostages, the bishop said. What do you call 50 dead Boko Haram members? In a statement issued on Thursday, Colonel Mohammed Dole of the Nigerian army said the troops of 195 Battalion in Damboa "successfully repelled planned Boko Haram terrorists’ attack" on residents and a military camp in Damboa, in Borno state. "In the early hours (0100 hours) of Thursday 9 January 2014, the insurgents attempted to attack Damboa to cause havoc and mayhem. "But due to timely information and gallantry displayed by the troops, the attack was repelled and inflicted heavy casualty on the terrorists," Dole said. While 38 fighters died, others fled with "various degrees of injuries", he said. Yeah, this is Nigeria so take military reports with more than a pinch of salt. The same guy says they're "winning" against Boko Haram, whatever that means. But if Red Dawn taught me anything it was even exaggerated body counts start with at least one dead. So, even if just one Boko Haram guy is dead it's a good way to start the day. Boko Haram, a Nigerian terrorist group with ties to al Qaeda, launched a major attack on a Nigerian Air Force base in the insurgency-wracked city of Maiduguri. A number of security personnel were killed and several aircraft were destroyed during the nighttime attack that is said to have been executed by hundreds of Boko Haram fighters. Hundreds of fighters assaulted the base on the outskirts of Maiduguri, the capital of Borno state, using trucks and even a stolen armored personnel carrier, beginning at 2:30 a.m. local time, according to The Associated Press. Boko Haram fighters yelled "Allahu akbar" as they attacked. A French engineer abducted by Islamist militants in Nigeria has managed to escape after nearly a year in captivity, officials said on Sunday, in the latest dramatic turn for French hostages abroad. "He watched his captors' prayer time. They always prayed for 15 minutes. 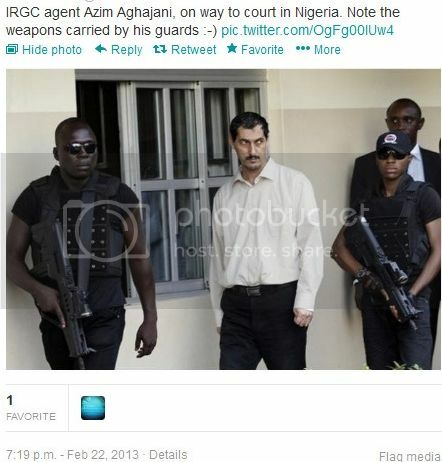 And yesterday they did not lock the door to his cell," Mr Adeleye said. "While they were at prayer he sneaked out and began to run." Mr Collomp stopped a motorcycle taxi and had it take him to the nearest police station, from where he was brought to Kaduna, the regional capital. In related news, a french Priest was abducted in Camaroon last week with reports that he was taken to Nigeria by his Islamist captors. I'm guessing his collar isn't going to do him any favors with the terrorists holding him. In a press statement today, spokesman of the JTF, Lt. Col. Sagir Musa said, “Intelligence report available to the Joint Task Force Operation Restore Order revealed that Abubakar Shekau, the most dreaded and wanted Boko Haram terrorists leader may have died. “He died of gunshot wounds received in an encounter with the JTF troops in one of their camps at Sambisa Forest on 30 June 2013. Shekau was mortally wounded in the encounter and was sneaked into Amitchide – a border community in Cameroun for treatment which he never recovered from. Easter Miracle in Nigeria: They Aren't Risen! 14 bad guys dead, none of them came back to life. Yet. Never totally rule out zombification. It could happen. Soldiers raided a suspected hideout for Islamist extremist group Boko Haram in northern Nigeria’s largest city of Kano on Sunday, sparking a clash that left 15 people dead, the military said. The military claimed that those killed included 14 Islamists and one soldier, while alleging the extremists were planning an Easter day attack in the city. Last year, the group killed 50 in an Easter bombing. "I saw three buses on fire. One of them was fully loaded with passengers waiting to leave the station at the time of the blasts ... There are at least 20 dead," said the rescue official who requested anonymity as he was not authorised to speak to journalists. "The figure may rise," he added. The guards are carrying Israel Military Industries made Tavor Assault Rifles (TAR-21). "His Iranian sponsors requested that he identifies and gathers intelligence on public places and prominent hotels frequented by Americans and Israelis to facilitate attacks," SSS spokeswoman Marilyn Ogar said in a statement. "There is conclusive evidence that Berende in collaboration with his Iranian handlers were involved in grievous crimes against the national security of this country." "We heard some people chanting, 'God is great, God is great' amid sounds of banging on doors of houses at about 1 a.m.," the teacher said. "A voice was heard ordering people to be slaughtered and also voices of children were heard screaming." Inusa said he and others later saw corpses with their hands tied behind their backs and their throats cut. Nigerian Taliban Reject Theory of ... "Evaporation" and "Spherical Earth"
Like rain. We believe it is a creation of God rather than an evaporation caused by the sun that condenses and becomes rain. Like saying the world is a sphere. If it runs contrary to the teachings of Allah, we reject it. We also reject the theory of Darwinism. Officials say there was an explosion at a beer garden in Nigeria’s northeast that wounded nine people. Bauchi state police chief Mohammed Ladan said an improvised explosive device went off late Sunday in the city of Bauchi. Nigerian Red Cross official Adamu Abubakar said a three-month-old baby is among the wounded.